The Girl Scout float design showcases a century of Girl Scout traditions and highlights today’s girls as capable of making great changes to benefit society—echoing the chorus of Andra Day’s and Common’s song: “It all means nothing, If you don't stand up for something.” This year an audience of more than 50 million will see the Girl Scout float, which features two dozen giant Girl Scout badges representing everything from science, technology, engineering, and math (STEM) and the outdoors to financial literacy and entrepreneurship, as well as the Gold Award, Girl Scouts’ highest award. 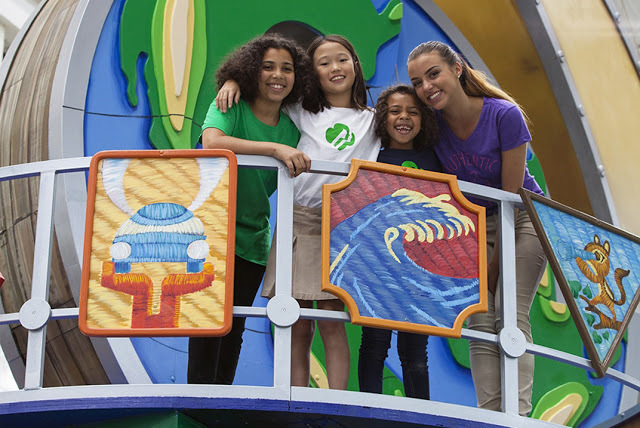 Three of GSUSA’s Citizen badges (Celebrating Community, Inside Government, and Public Policy) will be represented, emphasizing Girl Scouts’ legacy of leadership and community action, and the float will prompt viewers to take action themselves through the newly launched G.I.R.L. Agenda Powered byGirl Scouts—an initiative to inspire, prepare, and mobilize every G.I.R.L. to lead positive change. By making age-appropriate resources based on GSUSA’s proven programming accessible to all for the first time ever, the G.I.R.L. Agenda will provide hundreds of thousands of girls, and adults who care about them, with tangible ways to support causes that are important to them. So, what are you waiting for? Join Girl Scouts, Andra Day, and Common, and share what you stand for on social media using #GIRLagenda!